By the time Sridevi shows up in the massive-budget fantasy epic Puli, its few charms have worn off and the iconic actress appears like an empress who’s shown up at an unimaginative costume party. Chimbudeven’s film is a sluggish and boring affair, despite much going on: babies are Moses’d into baskets (alongside with breakfast), red birds talk in a human tongue but nobody considers this a big deal, and all-powerful vampire creatures wear lots of armour and chainmail to protect themselves from the puny humans. Regal and out of place as she is, Sridevi gamely embraces the lunacy and starts walking up the side of a pillar -- despite visual effects specialists from several countries working on this ‘epic,’ the laughable result is closer to Batman walking up walls in the 60s TV show. The effects, to be fair, aren’t all hideous. The animatronic creatures are well rendered, with frogs pointing out directions and birds laughing at poor jokes, and the horses in this film wear suitably intimidating gear, but that’s about all we can say in terms of positives. Oh, and the second half, full of long one-on-one duels, is significantly better than the first -- but that’s largely because Sridevi’s around and because the eternally insufferable Shruti Haasan is bound and (invisibly) gagged through most of it. 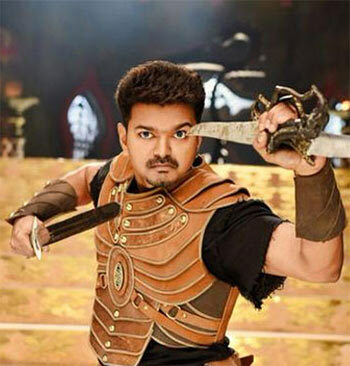 Vijay plays a villager called Magadheera, a well-liked fellow whose dad had his arm sliced off and sister had her neck sliced off, but he seems content to sit back and pretend he’s brave in order to flirt with Shruti Haasan, the chief’s daughter. It’s all quite pathetic, to be honest, what with Magadheera painting his eyeballs blue with poster colour and -- in flashback -- an older, long-haired Vijay with his mane fanned furiously, grimacing as if he were Sonu Nigam attempting to sing metal. There isn’t much a good hero could have done here either, though. Puli, made on a far bigger scale, is much grander and stupider, with Tinu Anand playing a saint with Marge Simpson hair and a nameless bloodthirsty demon introducing himself as “a bloodthirsty demon” as if he’s run out of business cards.